I found Disastrous by accident one day and I was pleasantly surprised. It was a nice mix of fun, angst, romance, and mystery. It ended with so many question still left unanswered and still so much more to explore about Marcus and Mia's past and future. And then there's the whole mob thing. I'm intrigued at how they'll get around THAT! I'm sure we'll hear more and more about this novel as the release date gets closer and I'm looking forward to sitting on the beach with this read in my hand! 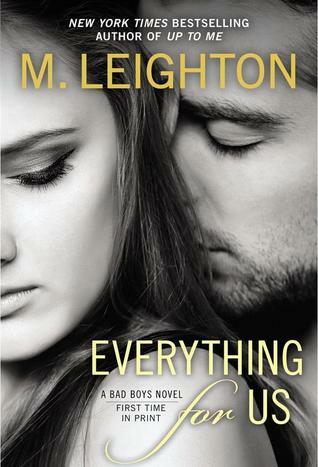 I first discovered M. Leighton with The Wild One and loved it, but was absolutely blown away with Down To You. This series has kept me on my toes the entire time, and no matter how hard I tried, I just could not figure out what would happen next. And trust me, I put a lot of thought into trying to figure it out. With Everything For Us, I am looking forward to seeing whether or not the ice queen will get the guy. Well, even without that, her becoming a better person and getting a HEA with or without the guy will be a crazy journey! I might have died a little inside realizing it doesn't come out until SEPTEMBER! Killing. Me.